Electric-powered stern anchor winches on the LSTs resemble towing winches on fleet tugs, but they are specifically designed for the job they do. The winches were supplied by Sandy Hill Iron & Brass Works, Hudson Falls, New York & Joy Manufacturing Co, Franklin, Pennsylvania with designs by Almon A Johnson Inc, New York, New York. They can be set to pay out at three different speeds and heave in at four speeds. While they are not constant-tension winches, they can be set to automatically keep a strain on the anchor cable to prevent the stern of the LST from swinging around while beached. The cables are 900 feet of high-grade plow steel wire 1-5/8 inches in diameter. The first 15 to 20 feet of the outboard end of the cable is painted yellow to make it easier to estimate when the anchor will break out. Every hundred feet the cable is marked with yellow bands--one band 9-inches long for each hundred feet. That is, at 100 feet, l band; at 200 feet, 2 bands; at 300 feet, 3 bands, and so on up to 700 feet. Halfway between the 100-foot markers there is one 12-inch white band. That is, there is only one 12-inch white band at 50 feet, 150 feet, 250 feet, etc. Between 700 and 800 feet, the entire cable is painted yellow. The last 100 feet (800 to 900) are painted red. 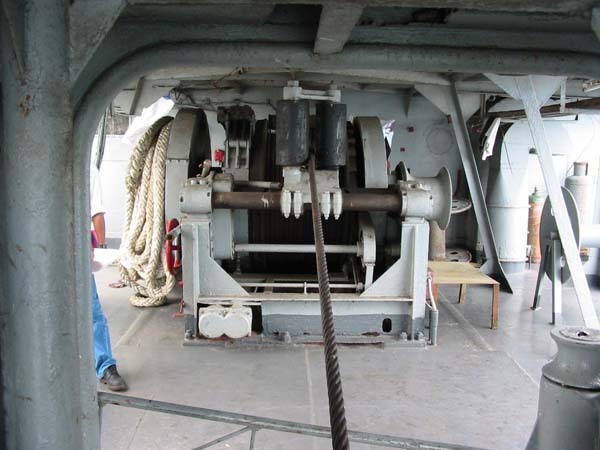 The stern anchor winch aboard former US LST in Philippenes. The anchor was a 3000-pound Danforth type. A stern anchor is secured on a catting frame at the stern by a wire strap stopper extending from the main deck down under lugs on the shank of the anchor and back up to the main deck. A turnbuckle at one end of the strap facilitates tightening, and a pelican hook at the other provides a quick release. Two views of the Danforth type anchor. The stern anchor of LST 325 was removed and placed on the main deck to facilitate her recent dry docking. 1. Rig the anchor buoy. 3. Push setup button to energize controls. 4. Move controller 1 point left to DRIFT and back to OFF to make sure motor brake operates. 5. Release “dog” on cable drum and secure with “pedal latch”. 6. See that spiral jaw low-speed clutch is open. 8. On the order to let go the anchor, release clutch brake 20 turns or more. 9. When the anchor digs in (sets), move the controller back to OFF position. CAUTION: Failure to release clutch brake will damage motor and motor brake! Normally, the anchor is dropped between 700 and 500 feet from the spot where it is expected the midships portion of the LST will ground. Occasionally, however, the entire 900 feet of cable will be run out and lost overside. In order to expedite recovery of the cable and anchor, an emergency buoy is rigged so that it can be quickly and easily attached to the end of the cable as the cable pays out. The buoy is triced to the lifelines or at some other convenient place. The buoy line is led to the anchor cable fairleader and a clove hitch loosely looped around the cable and hung on the fairleader. In an emergency, the clove hitch can be quickly drawn tight around the cable and the buoy either tossed overside or pulled free from its lashings by the weight of the cable. After the anchor has been dropped during the beaching run, the man in charge must keep the conn informed of the amount of cable out, the tension (strain) on the cable, and the angle (direction the cable is tending) of the cable. Tension is reported in the same manner as for a bow anchor; angle is reported by the clock method. After beaching, heave in all slack in the anchor cable by moving controller to SLOW or to NORMAL heave. Then set up on the clutch brake. If the wind or tide tend to swing the stern, maintain strain on cable by setting controller in AUTOMATIC. Set tension adjustment at 15,000-pounds or higher, if necessary. This picture shows the stern anchor winch controller and the clutch brake control. 1. Move controller to OFF position. 2. Release clutch brake compressor. 3. Move controller to SLOW heave. 4. When cable drum stops turning, step down on the mechanical latch pedal and engage low- speed spiral jaw clutch. Make sure you push hard enough to engage fully. 5. Move controller to NORMAL heave and attempt to retract vessel. If the anchor drags, move controller to OFF. 6. If motor stalls because it can’t start vessel, move controller to OFF for a short interval. 7. Repeat the heaving operation until vessel moves astern. CAUTION: Never leave controller on heave unless the motor is turning. 8. As the ship begins to move, the motor will speed up. When the speed indicator (tachometer) shows 500 rpm, move controller to MEDIUM heave; when the motor reaches 800 rpm, move controller to HIGH. NOTE: If it is necessary to slack off the stern anchor cable while the winch is in low gear, push the bypass pushbutton below the low-speed clutch and move the controller to SLOW stick-out. When sufficient cable has been payed out, release the button and winch will stop. 1. Set up on clutch brake compressor to shift into high speed. 2. Set controller on automatic heave with tension adjuster setting between 15,000 and 20,000 pounds. 3. 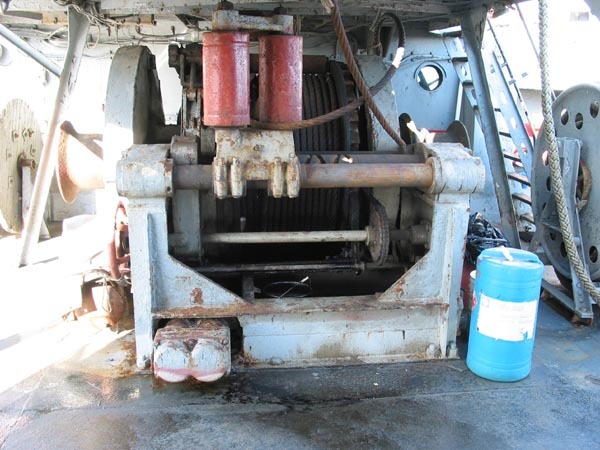 The winch is now under automatic control and should heave in cable fast enough to keep out all slack as the vessel backs, but the conn must be kept informed of the situation at the stern at all times in order to keep from overriding the cable. NOTE: If necessary, put the winch back into low gear to get the anchor to break ground.